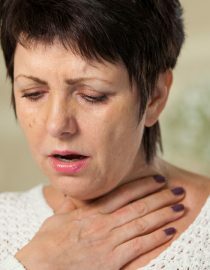 How Common Are MS Breathing Problems? Do MS Symptoms Cause Breathing Difficulties? It was during my first multiple sclerosis (MS) exacerbation that I experienced my first MS hug. I thought I couldn’t breathe. I was terrified and had no idea what was happening to my body. Knowing nothing about MS, I thought I was going to die. The emergency room doctor did very little to help me understand what was happening. The MS hug is caused by your intercostal muscles involuntarily contracting. This symptom is incredibly stressful and painful, but does it cause long term harm to your ability to breathe? Fortunately for most people with MS, the multiple sclerosis hug and breathing troubles occur less often than most other symptoms. In most people, this symptom will last only for a few hours — mine lasted days on end. Most likely though, a person will have MS for many years and never have this symptom. Breathing difficulties with MS are usually caused by three different factors that can be regulated with careful monitoring. The intercostal muscles, while not the most important respiratory muscles, are still very valuable in aiding your chest walls in expansion and contraction. These intercostal muscles can be affected by your MS and, over time, are capable of becoming fatigued or losing strength. Inflammation can cause an exacerbation of this symptom. Often, this type of exacerbation will be treated with anti-spasticity or anti-inflammatory medications to relieve a vast majority of your discomfort. Sometimes, this symptom can cause cumulative damage. A person’s ability to speak and converse for long periods of time can become exhausting and a longer-term treatment plan with speech pathologists and physical therapists will be put in place. Not all breathing problems are caused by MS itself. Unfortunately, there can be times when your body will react negatively to the medications you have been prescribed. I love that my doctor’s office reviews all of my medications at every appointment. This has become a standard practice with any doctor worth their salt. Still, it is important to make sure your medications are being watched closely. Tranquilizers, muscle relaxants and opioid analgesics can reduce your body’s ability to breathe normally. Take heed to the dosing directions you receive and be sure to pay attention to changes in your body while taking these meds. Swallowing problems, medically called dysphagia, can occur when a person’s muscles in the tongue and throat are not working properly. This symptom usually happens during a more advanced stage of this disease. With dysphagia, a person will struggle with chewing and swallowing. The end result is that food will become inhaled into the trachea rather than traveling down the esophagus. Food traveling into the trachea is called aspiration. Once in the lungs, the presence of food can cause pneumonia and abscesses that need to be treated immediately. Fortunately, there are physical therapies and medical treatments that can assist in protecting people from falling seriously ill from this scenario. However, this is a serious situation and one that must be looked at for long-term treatment plans in order to ensure patients’ symptoms do not get overlooked and under treated. For people who are further progressed in their MS journey, it is important to create a strong support system that is aware of the risks involved and the warning signs to watch out for with swallowing disorders.